The Lifestyle Holiday Vacation Club at Hacienda Tropical is a wonderful place to escape to when a break from the daily grind is in order. You can find this Dominican Republic beach resort overlooking the ocean near the town of Puerto Plata. Just 30 minutes away is the International Airport of Puerto Plata, so guests don’t waste a lot of time in transit after their planes land. The Lifestyle Holiday Vacation Club at Hacienda Tropical, or the Hacienda Tropical, as it is known for short, occupies a wonderful spot. Guests are just steps from the sands of Cofresi Beach, where the waters are often calm and ideal for swimming and snorkeling. When guests aren’t spending time on the beach, they can take advantage of the resort’s main pool. This large pool has two levels, one of which is for kids, and another that has a swim-up bar and is for adults. Another smaller pool with a large flagstone patio also provides a good place to swim or sunbathe. Should Hacienda Tropical guests so desire, they can also enjoy any other number of side activities, with examples including jogging, taking dance lessons, playing beach volleyball, or playing tennis. Suffice it to say that getting bored really isn’t an option. The rates are all inclusive at the Hacienda Tropical. Once the upfront fee is paid, guests don’t have to worry about paying for food, drinks, non-motorized water sports, or a bunch of other things. They also get to enjoy the facilities at two of the resort’s sister properties, both of which are within walking distance. 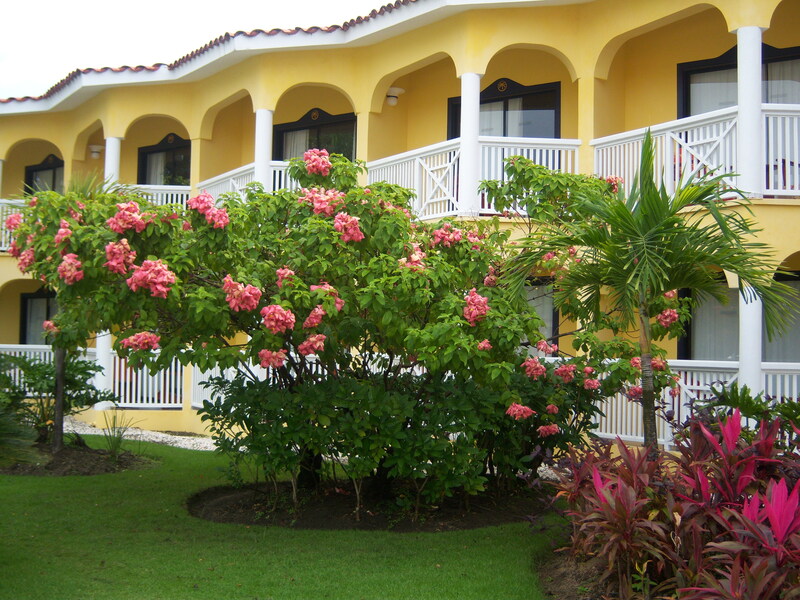 These affiliated properties are the Hacienda Garden and the Hacienda Suites. As for the Hacienda Tropical guest units, they include tasteful rooms and suites that are housed in low-level, Mediterranean style buildings. Among the many standard amenities are locally crafted furniture, cable TV, a coffee maker, a mini fridge, and a hair dryer.